Gus Hansen is a professional poker player from Copenhagen, Denmark, currently residing in Monaco. 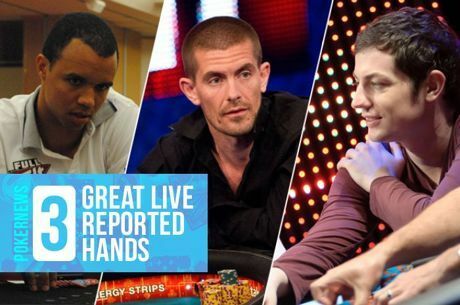 Hansen is known as one of the best players on the live tournament circuit with more than $10 million in career tournament earnings, and the world's most prestigious poker trophies such as the WSOP bracelet a WPT title in his collection. Hansen was born in 1974 near Copenhagen, Denmark. In the poker world he is mostly known by his nickname “The Great Dane”. Hansen has one World Series of Poker bracelet on his shelf as well as three WPT trophies. He started off as a professional backgammon player and a youth tennis champion, but in 1997 Hansen switched to poker and never looked back. Since then he won numerous major poker events and collected big money finishes. He is considered the most successful Danish poker player with the 2008 WSOP Main Event champion Peter Eastgate being his only local competitor. Hansen is also a successful online businessman running such ventures as Betfair Poker, ThePlayr.com and GusHansenTV. Hansen has one World Series of Poker bracelet in his trophy collection which he won in 2010 at the WSOP Europe in London. Hansen then took down the £10,000 Heads-Up High Roller event outplaying American James Collopy for the title and taking home £288,409 along with the poker's most prestigious trophy. Another big score came at the 2012 WSOP when Hansen won the $25,300 One Drop Mega Satellite which rewarded “The Great Dane” a $1 million seat at The Big One for One Drop event – the biggest event in poker history with more than $18 million as the first place prize. However, the big event didn't go too well for Hansen as he busted on Day 2 and left the table empty-handed. Hansen collected his first World Poker Tour title in 2002 when he won the Five Diamond World Poker Classic $10,000 Final Event in Las Vegas for over half a million dollars. His second WPT title came one year later at the L.A. Poker Classic $10,000 Championship Event where Hansen again took home just over half a million dollars for winning the tournament. Then in 2004 he finished in first place at the PokerStars Caribbean Adventure $7,500 No-Limit Hold'em Event for $450,000 which Hansen received together with his third WPT title. Hansen has two European Poker Tour cashes on his record both of which came in 2005. He first collected €15,800 for finishing in 16th place at the €10,000 EPT Grand Final in Monte Carlo in March. He then took home another €78,000 after making the final table at the EPT Barcelona €4,000 Main Event eventually finishing the tournament in fifth place. 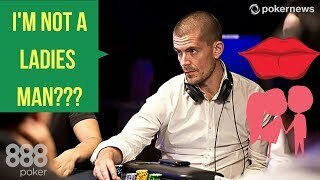 In February, 2005 Gus Hansen won the $400,000 Grand Final at the Poker Superstars Invitational Tournament in Las Vegas and collected a $1 million cash prize. Two years later he came out victorious in one of the most prestigious tournaments in the world, the Aussie Millions Main Event. Hansen took home 1.5 million in Australian dollars for his win. Another million dollar cash came in 2010 when Hansen won the FullTiltPoker Poker Million IX televised event. In 2012 Hansen came back to the Aussie poker scene to collect another $800,000 for his third place finish in the $250,000 Challenge event. Gus Hansen was a member of Team Full Tilt until the Full Tilt online poker site was closed in June, 2011. On October 2, 2012 Hansen became the first player to sign a sponsorship deal with the newly re-launched Full Tilt Poker. In 2004 Hansen was voted one of the 50 Sexiest Men in the world by the People magazine. Hansen dated one of the best female tennis players in the world, Caroline Wozniacki.